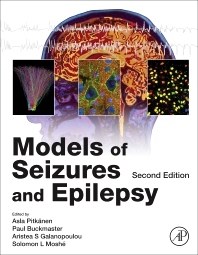 Models of Seizures and Epilepsy, Second Edition, is a valuable, practical reference for investigators who are searching for the most appropriate laboratory models to address key questions in the field. The book also provides an important background for physicians, fellows, and students, offering insight into the potential for advances in epilepsy research as well as R&D drug development. Contents include the current spectrum of models available to model different epilepsy syndromes, epilepsy in transgenic animals, comorbidities in models of epilepsy, and novel technologies to study seizures and epilepsies in animals. 1. What can we model? 77. What do models model? What needs to be modeled? Dr. Buckmaster is an Associate Professor of Comparative Medicine and Neurology at Stanford University School of Medicine in Stanford, California. His laboratory uses electrophysiological and anatomical techniques to evaluate neuronal circuitry of temporal lobe structures in normal and epileptic brains. He is a veterinarian with 25 years of experience investigating mechanisms of temporal lobe epilepsy using anatomical and electrophysiological techniques. He has worked with a variety of mammalian species, including primates, carnivores, and rodents. He has an h-index of 29 and has published over 74 articles. Dr. Galanopoulou is an Attending Physician at the Clinical Neuroscience Center and EEG lab at Montefiore, a Professor of Neurology and Neuroscience at Albert Einstein College of Medicine in Bronx, New York. She is also the co-chair of the AES/ILAE Translational Research Task Force of the ILAE, which works towards the optimization of the use of animal models of seizures, epilepsies, and comorbidities in epilepsy research. She is a clinical epileptologist with 15 years’ experience with epilepsy basic research using a variety of animal models and particularly models of early life seizures and epilepsies. She has an h-index of 29 and has published over 84 articles.